The final school bell chimes in mid-afternoon at Timberline High, signaling time to begin preparation for another baseball practice. Players act as groundskeepers andscatter across the diamond with rakes and garden hoses. Senior Eddie Gordon can hardly wait to get started. Baseball has been on his brain from the moment he woke. Sprinting up the walkway, his excitement is pulsating; time is of the essence when it comes to practice. Seconds from the gate, his eagerness combusts. "WASSUP?" he spouts from beyond the bordering chain-linked fence, waving his arms frantically. The team responds harmoniously, mimicking the famous Budweiser commercial. Gordon's smile permeates across the field. This is the life. 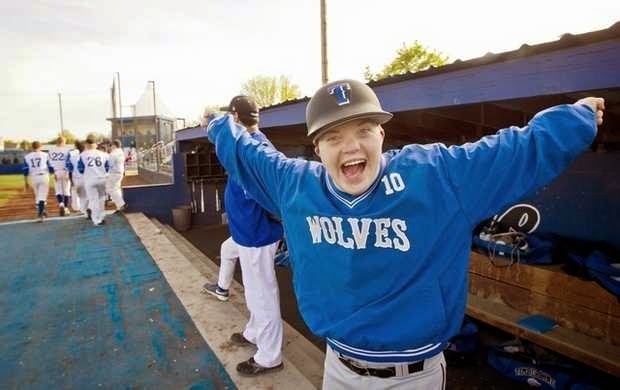 He's been an integral member of the Timberline program for the past two seasons, contributing as the batboy and serving as the team's unofficial moral deputy. Born with Down syndrome, the opportunity to be one of the guys has meant the world. But Monday night, his usual duties will take a back seat when he becomes a varsity player. After making an agreement with Centennial, Timberline coach Larry Price will pencil Gordon's name in the leadoff position to ceremoniously open Senior Night with an intentional walk. Because for everyone involved in the program, Eddie has meant the world. "He's a unique young man, and he's got so many things to give to other people," Price said. "He brings something new everyday, and once you meet him, you fall in love with his heart. … He's just a phenomenal person - he's Mr. Timberline. "Timberline Athletic Director Tol Gropp reached out to the faculty via email. "We are lucky enough at Timberline to have some very special students. Eddie Gordon is one such young man. We have a rare opportunity to give back," he wrote. "I know it would mean so much to Eddie to have the support of his peers, teachers and staff as he steps to the plate that night. "I'm asking that you please encourage your students and possibly take a few moments of your evening to come out to the game in support." •••Ed and Becky Gordon didn't know what to expect 18 years ago. There were no warnings, Becky said, but their first child was born with an extra copy of chromosome 21, the developmental cause of Down syndrome. "We didn't know any different," Becky said. "We never got hung up on the fact he was Down syndrome. He's our son, and we love him. "Eddie was easy to love with his natural, bubbly persona, the type of magnetism that instantly makes someone feel at ease. At no surprise, Eddie had always been embraced within the community throughout his adolescence, but he remained relatively unknown socially. That all changed in the spring of 2013. Price formed a relationship with Eddie, whom he refers to as "Fast Eddie," while teaching his lifetime sports class. With the suggestion of one of his sons, Cody, the coach invited Eddie to the dugout at the beginning of the season. Vivacious as ever, Eddie quickly integrated himself into the program, and before long, he was singing "Take Me Out to the Ballgame" during the fifth-inning stretch. "Coach Price made that relationship on his own," Becky said. "That's what I admire the most. It's a special thing. "The tradition ignited the Wolves' magical run to a 5A state championship after a 1-7 start to league play last spring, and launched Eddie into "celebrity status" on campus. "It just took off," Price said. "The student body was coming to our games to hear him sing. That was pretty cool for the team, because they had bigger crowds and a lot more energy in the stands. It was all because of him. "Eddie's growing popularity expanded this school year as more people recognized his contagious spirit. He nabbed a customized Timberline jersey for Christmas, school buddies invited him on a Vegas road trip, and he even was voted prom king. More importantly, his intellectual capabilities improved. "My son grew leaps and bounds developmentally, not just self esteem - his language increased. They don't understand the impact they've had," Becky said. "I remember when he was 6 years old, one of these speech therapists said he's got all the language (abilities) he's going to have. It wasn't much. "The explosion of language happened because of this baseball team and this school. I feel indebted to this group of people; I don't think it would have happened without them." •••Timberline has felt the highs and lows over the past two seasons. In 2013, the Wolves gelled at an opportunistic moment and won state. Barring another miracle, the Wolves are unlikely to advance beyond next month's district tournament. This season's hardships haven't affected Eddie's fervor. The team is 5-11 in conference, but he remains positive and grateful, unintentionally reminding his peers that superficial aspects of life aren't nearly as important. Life trickles down to individual relationships, not wins and losses. "He's pretty much my biggest inspiration," said one of Price's sons, Parker, who starts at shortstop as a sophomore. "He's made me a better person. I look at life in a whole different way. Life doesn't revolve around baseball, it revolves around being a good person. "Added senior catcher Tyler Roper: "Whenever he comes through the gate, he always has this huge smile on his face. We see him and we're like, 'Man, it must be a good day.' To always stay positive like that is something a role model would do, and I definitely look up to him. "Former minor-league prospect and Boise State football player Hilton Richardson joined the Timberline program last season to become more involved in the community. In Richardson's first year as junior varsity coach, Eddie provided an invaluable lesson. "He shows me as a coach, you're not just coaching baseball. I want to do everything I can to prepare these young men for everything in life," Richardson said. "At some point, which I'm learning now, you're not going to be able to play the game forever. You need to be a well-rounded human being. "Eddie definitely makes you recognize the importance of all those life skills, things that will take you so much further in life than anything on the field can. That's perspective." •••Roper said he started throwing a baseball when he was 2. The Senior Night celebration will be roses, tears from adoring parents and, for some players, the end of organized sports. For Eddie, it's a new beginning. "To be perfectly honest, I think he deserves it," Roper said. "I think Senior Night is going to be more memorable because I'm going to share it with someone like Eddie. "When informed of the leadoff surprise, Richardson was moved to tears. He has experienced professional and major college athletics, but seeing the smile on Eddie's face as he approaches the plate, he said, will top them all. "I had a chance to play with guys who I had their baseball cards, but it's always more than that," he said. "That is going to be a lifetime experience to see, and I can't wait. "It truly exemplifies being in love with baseball." •••Three days ahead of Senior Night, Eddie perches in the first-base dugout, camouflaging his blue Timberline hat underneath his hoodie when Price initiates conversation. "Why do you come out to the baseball field?" the coach asked. "My favorite thing is watching the game and cheering the team on," Eddie replied. "That's a lot of fun stuff." Price often acts as an interpreter for Eddie, who is still working on his enunciation. But before the two parted ways, he perfectly communicates his thoughts. "Who's your favorite team?" Price asked. "Timberline," Eddie said. "I love my team."